Sourdough is the best traditional grain prep method, hands down. Because… of all the grain prep methods — soaking, sprouting, souring — sourdough is the most effective way to prepare grains for best digestion and nutrition. That’s just one reason I love using sourdough and rely on it for nearly all our baking. There are other reasons, too. Like, how beautifully sourdough leavens baked goods because of the action of the wild yeasts in the starter. And of course, the flavor — a delightful tang that just can’t be beat! Then, combine the power of sourdough with the health of einkorn — a healthy 5,000-year-old variety of wheat — and you have an even better combination! In today's post, I’m going to show you how to make an einkorn sourdough starter (both print and video) and tell you how to care for it. We’ll also go over the differences between an einkorn starter and other grain-based starters. Einkorn is a 5,000-year-old variety of wheat that many find easier to digest than modern wheat (it has gentler gluten and less and gentler starch). Yet it's a bit tricky to figure out how to use because it behaves differently. You can skip the learning curve by using my free & AMAZING no-knead einkorn bread recipe! The recipe is FREE, easy, and healthy, and takes only 15 minutes of hands-on time! Click here for the free recipe: No-Knead Sourdough Einkorn Bread. Here’s why you should embrace sourdough in your traditional kitchen (provided you can eat grains and gluten). It’s the most nutritious. If done right*, sourdough is the most effective grain preparation, surpassing the effectiveness of soaking or sprouting. The wild yeasts and bacteria in the starter pre-digest gluten, consume grain sugar and neutralize anti-nutrients such as phytic acid and enzyme inhibitors. Einkorn is already easier to digest and has less phytic acid than newer grains, so if you combine this ancient grain with the power of sourdough, you end up with marvelously digestible and nutritious baked goods! *What do I mean by “if done right”? At the beginning of the recipe, all the flour is combined with the starter for the entirety of the souring time, except perhaps for a bit of flour used for rolling or handling later on. The souring time will be done in a warm location, which is essential for the sourdough starter to do its important work. And, the souring duration will be long enough, usually 5 to 24 hours, depending on temperature (the warmer the location, the faster the souring time can be). The power of natural leavening. It’s amazing really — the wild yeasts in your sourdough starter are powerful. They produce gases as they eat the starch in einkorn, and this actually rises your dough. No need to purchase store-bought yeast because your sourdough starter does the job. It’s beautiful to watch and simply like taking part in a miracle — miracles which could happen daily in your kitchen! The taste. Myself, I love a good tang, and sourdough delivers. 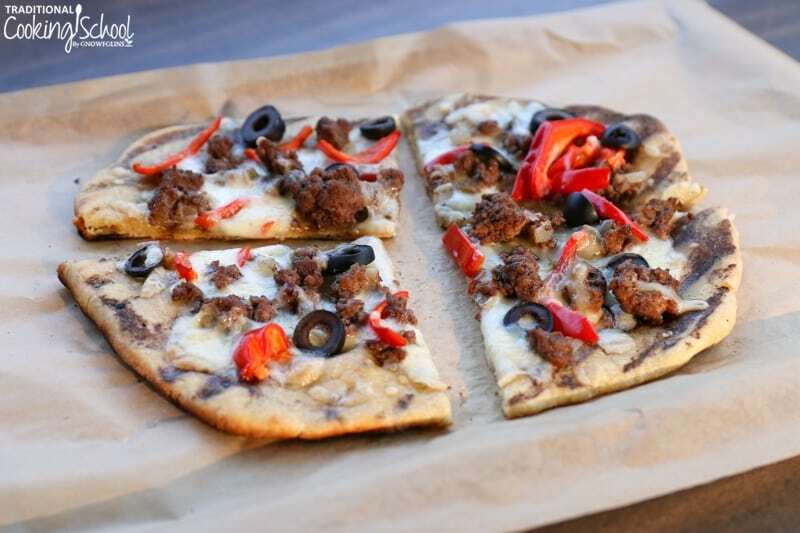 Sourdough doesn’t have to be overly sour, however. If your family doesn’t care for sour, add a bit of baking soda to the batter or dough right before baking. Baking soda reacts with the acid of the sourdough to “sweeten” the dough. This and other tips for reducing the sour can be found in this blog post — 6 Tips to Prevent “Sour” Sourdough. Not to scare you, though, because most sourdough recipes are not overly sour anyway! In order to use sourdough in your kitchen, you need a sourdough starter. This is a batter-like mixture of flour and water that you feed and care for regularly in order to cultivate an active colony of wild yeasts and beneficial bacteria right inside it (it’s microscopic). You use some of the sourdough starter in your baking (by combining it with flour and other ingredients), always making sure to reserve a portion of it that you keep going through regular feedings of more flour and water. When you're ready to maintain an einkorn sourdough starter, you've got 2 options. You can either transition another sourdough starter over to einkorn flour, or you can start a fresh einkorn starter. Here's how to transition a sourdough starter to einkorn; I covered it on a past #AskWardee. 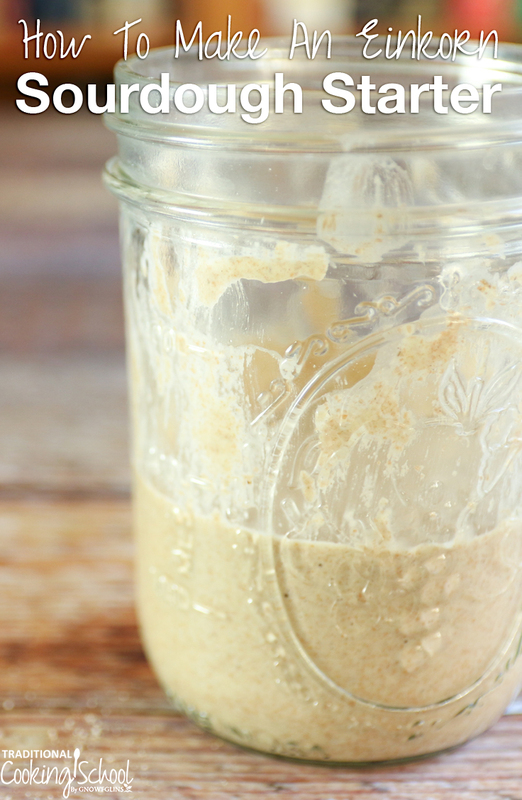 Keep reading to find out how to make an einkorn sourdough starter from scratch. Before I show you how to make a starter, let's talk about the unique qualities of an einkorn sourdough starter. If you have experience with sourdough, it may have been with a wheat or rye starter. The care and feeding (and even starting) of these starters is similar to an einkorn sourdough starter. Their behavior, however, is different. It comes down to 3 things. First, since einkorn absorbs less water, the starter tends to be runnier. You can easily adjust for this by adding a bit more flour or a bit less water at each feeding. Which, by the way, is a good idea. Because a starter on the thicker side works better in Traditional Cooking School's recipes. Second, while a whole wheat or rye starter will often double or triple in size at its peak (the height of activity), einkorn simply does not. So don’t rely on height for signs that it’s doing well. Instead, use the other signs of an active starter to gauge your starter’s health — that it’s bubbly, domes slightly, produces hooch (yellow liquid), and smells fresh and sour. Check out the play-by-play video above. And here are the instructions written out. Feeding 1. Put 1/4 cup water and 3/8 cup flour (1/4 cup + 1/8 cup) in a 2-cup glass jar. Stir vigorously. Scrape sides. Cover. Allow to sit for 12 hours. Feeding 2. 12 hours later, if you don't see life, stir again. Scrape sides. Cover and allow to sit for 12 more hours. If you do see life (a few bubbles), add 1/4 cup water to the jar. Stir well. Add 3/8 cup flour. Stir vigorously. Scrape and cover. Set aside for 12 hours. Feeding 3. 12 hours later, if you still don't see signs of life, dump out this mixture and start again. If you do see life (a few more bubbles), remove 1/2 of the starter, add 1/4 cup water, and stir. Add 3/8 cup flour and stir. Scrape and cover. Allow to sit for 12 or so hours. Feeding 4. Remove 1/2 of the starter. Add 1/4 cup water and stir. Add 3/8 cup flour and stir. Scrape and cover. Allow to sit for 12 or so hours. Feedings 5, 6, 7 … Continue with this routine until your starter consistently shows signs of life (bubbles, hooch and domed), and is at least five to seven days old. If, after day 3 or more, your starter does not show much activity 12 hours after its discard/feeding, try giving it a good stir without discarding and feeding. Sometimes this pause gives the organisms a chance to catch up and the starter an opportunity to take off. Then when you're satisfied it's behaving well — it's bubbly, domes slightly, produces hooch (yellow liquid), and smells fresh and sour — use it in recipes! Think about it… If you don't discard some each time, you have to feed it MORE flour each time (because it's a larger quantity of batter to keep going). First 2, then 4, then 8, then 16…. up to 256 from the first mixture after just 4 days! And EACH ONE needs to be built up to maturity (3-5 days with 2 feedings a day). 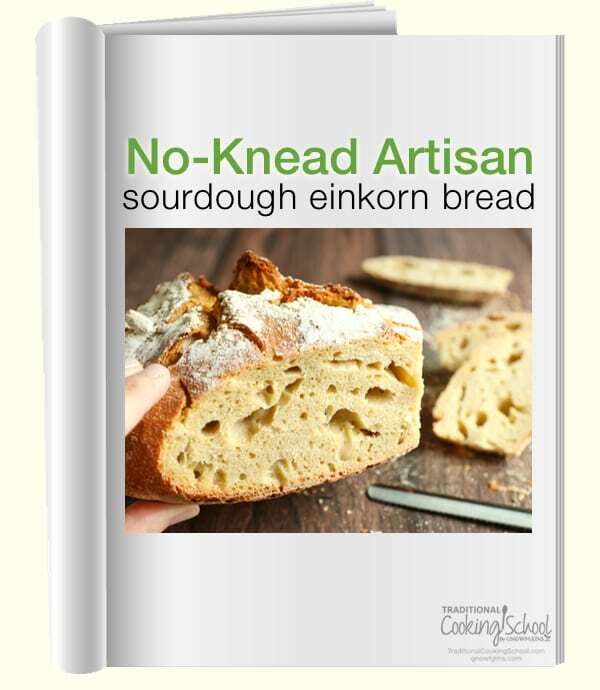 You'll love the recipes in our Einkorn Baking eBook & Video Package (many of which are sourdough). Or in the Einkorn Baking eCourse that comes with your membership to Traditional Cooking School. Also, try some of our favorite einkorn recipes like Einkorn Sourdough Bagels, Sourdough Einkorn Cinnamon Rolls, and Sourdough Einkorn Grilled Pizza Crust! Or click here for a FREE recipe: No-Knead Sourdough Einkorn Bread. Have you worked with einkorn sourdough? 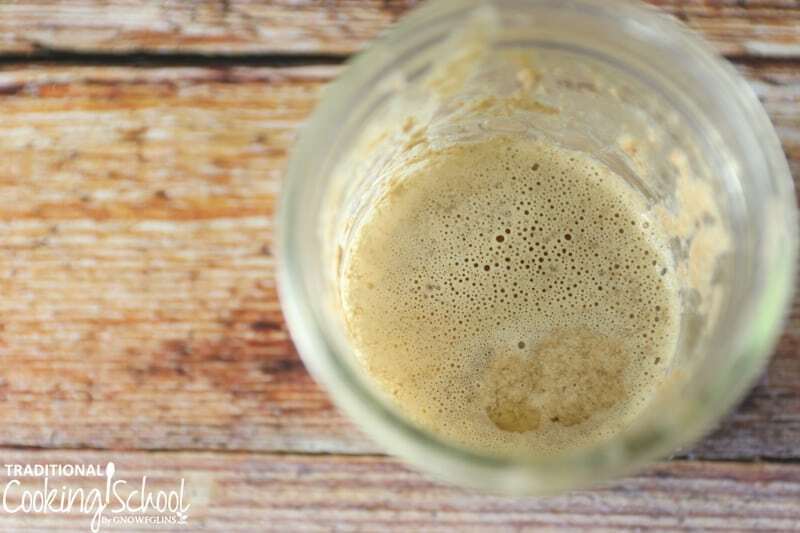 Have you started or kept an einkorn sourdough starter? 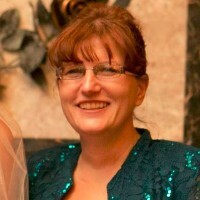 Got any tips to share? Comment below! Can one use this starter in a bread machine? We don’t use or recommend a bread machine because the cycles aren’t long enough to give the dough a proper souring (you need 7+ hours of souring time) so I’m not sure if you could use this starter in a bread machine. Sorry! If you have trouble getting a starter going with this wheat, what would happen if you put a tiny bit of sauerkraut juice in the starter? Anything? Something bad? I have wonderful sauerkraut fermented right now with plenty of juice…. Instead of discarding as the starter develops, why not use the “discard” to make another starter to give to a friend who might want to do einkorn sourdough as well? I don’t discard any but keep on with the procedure. I consider it a waste to discard. Another tip I came across for a lethargic starter is to put it in the fridge for a couple of days. Take it out let it reach room temp and continue feeding. Helps in my case. Another idea for the “discard”–use it to make crepes. I got the idea from Nourishing Days. They use 1 cup “discard,” 1 egg, and a pinch of salt. Mix well, and then fry in a well-greased, well-heated pan. I have been making Amish Friendship Bread for a while and after reading the idea for sourdough starter, thought I’d try it with the Friendship bread in place of the “sharing.” I now keep the starter going to keep up with all the crepes (and pancakes) we’ve been making. I’m assuming sourdough should be just as good! Is anyone selling einkorn sourdough starter? I would like to purchase some that is already established. But a google search only shows it for sale on etsy. Maybe its just me but that doesnt seem like a reliable source… 18 year old einkorn starter can that be right when supplies have been very limited until the last few years? How do you keep the starter, when do you feed it after it is going? Still twice a day? If you’re leaving your starter at room temperature you should feed it every 12 hours. You can also refrigerate it and feed it every 24 hours. I was wondering if after you have your started established and can use it do you continue to feed it every 12 hours or do you drop back to 24 hours? If you’re going to leave your starter at room temperature than it must be fed every 12 hours. You can refrigerate it between feedings if you want to go 24 hours. I have a sourdough starter that I started with einkorn flour, and if I leave it more than 12 hours or so (I try to feed it twice a day but life sometimes leaves me forgetting), it gets almost like a shell on the top and looks potentially mouldy. Do they go bad?? There’s the yellow liquid under the top but it doesn’t bubble through the top ‘crust’. I tried to add a picture but I can’t figure it out. It doesn’t smell mouldy. Thanks! Not feeding at about 12 hour intervals can result in what you are seeing. It’s also possible to need to feed more often than twice per day during warm weather. Starters can go bad if it’s too long between feedings. Thank you so much for the reply! Perhaps moving it to the fridge would be a better option as I’m not using it daily for baking. It has been pretty warm around here lately so it’s possible it does need even 3 feeds a day. Fingers crossed I haven’t ruined it! I cannot get einkorn flour in the country where inlive. Can i use plain whole wheat flour? I’ve been making an einkorn sourdough starter per your directions. On the third day it was nice outside so I decided to let it get some fresh air. The fresh air and just the right temperature made it double in size and was so fluffy! I was SO excited because I had tried this once before and it had never done this. However, I have since kept it inside and can’t seem to get it to double in size again. It has bubbles, smells sour and is fed twice a day. My question is does the starter have to double in size every time after feeding for it do be an established starter? I’ve since tried wrapping it in towel, leaving it in the oven with the light on. Nothing has seemed to make it double in size. I’m using freshly ground einkorn flour. Would that make a difference? I would really LOVE for this sourdough to work. I’m newly to Trim Healthy Mama and would love to have this sourdough in my back pocket. 🙂 Thanks! I’m pretty sure Wardee says this one does not double in size. Listen to the videos for more. Hello! Question: I just started my starter last night, so only one feeding so far. This morning it has a very dark layer on top. Is this okay? Should I just stir it back in with the next feeding? Or should I scrape it off? It is a sign that your starter needs fed. If you’re feeding once a day you may want to feed it twice a day. Question>> I see that stirring is important for the starter. Has anyone thought of using an immersion blender? Seems to me that would be excellent for aeration, curious to know if anyone has tried it out. I’ve been making a starter following Oliver Strand’s recipe in NYT Cooking, but I’ve been making it with Einkorn. I’m nearly a week in and it hasn’t really gotten bubbly or domed . It’s runny, smells really yeasty/a bit alcoholic and separates slightly between stirrings. This recipe says to wait up to 4 days during this step for the starter to get foamy before feeding again, but I thought maybe the inaction has something to do with Einkorn’s difference from regular wheat flour. My starter hasn’t gone bad, right? Also, on a separate note, doesn’t metal react badly with bacteria on contact? Should I not be using a metal spoon to stir? You wouldn’t want to leave a metal spoon in your starter. Brief contact should be okay. I followed the directions and the starter bubbled up nicely the first day and also after the 2nd feeding. I used a 2 cup mason jar as directed and it literally bubbled over so I moved it to a slightly larger jar. It has not bubbled up since and it has been 4 days, although I have continued with the every 12 hour feedings. I also do not see any evidence of “hooch”. Should I start over? I am using Jovial Einkorn whole wheat flour, if I start over would it also work to use Jovial Einkorn All Purpose flour? Why would it seem to work so wonderfully for the first 24-36 hours and then just stop? Thank you for your advice! Einkorn usually doesn’t double in size after feeding. As long as it’s bubbly, domes slightly, produces hooch (yellow liquid), and smells fresh and sour your sourdough starter should be working. If your starter is not than you may need to start the sourdough starter again. Is your starter warm enough? An all-purpose flour is not likely to give much activity and produce a strong starter. You want a whole-grain flour with the germ and beneficial organisms still included. I started an einkorn sourdough started a few weeks back and I love it. However I need to switch it to wheat. Is that possible? I know you can switch from wheat to einkorn but would this work switching an “original” einkorn starter to wheat? And if it is possible what wheat is the best to use? 100% non GMO whole wheat is best. Organic is aways good if you can get it. I started my first einkorn sourdough starter, actually my first ever sourdough starter, a few days ago. Your instructions were clear and easy to follow. My starter began slowly, but is now rocketing to sourdough heaven, with lots of life and bubbles. Hi there, is the wholewheat einkorn flour used in the video? If so, is the recipe the same for all purpose einkorn flour? Yes, whole grain einkorn is what Wardee uses. You could use all purpose einkorn but whole grain is preferred because it has the most abundant organisms on it.